Work matters to our wellbeing and we know that economic activity is one of the key drivers of life satisfaction. What about comparisons between those in work but in different occupations? The ONS personal wellbeing questions can capture different aspects of work on our lives. Not only do they cover our overall sense of satisfaction with our work but they also ask about sense of fulfillment – ‘worthwhile activities in life’ and ‘anxiety’ both of which we might expect to differ across different types of occupation. We have taken 3 years of annual population survey data and computed personal wellbeing by standard occupation code. We have done this for 90 groups of occupations and for more detailed 369 individual occupations. By aggregating across three years of data we can get better estimates of wellbeing for these occupations – although even with such a large sample there are some jobs for which we can’t provide robust estimates (we have suppressed results with very low samples). The data is available for download and we have included sample sizes and standard deviations so that analysts can explore them in more detail. We have also included income data from the Annual Survey of Hours and Earnings against the same occupation codes to allow for comparisons between wellbeing and earnings. So there is lots to explore in this data. What are some of the headline results? Well perhaps no surprise that Chief Execs and Senior Officials consistently come out as having among the highest levels of well-being. However those in health, welfare, teaching, agriculture and sports report being the most fulfilled – with the highest levels of ‘worthwhile activities’ in life. Hairdressers report high levels of happiness, but the clergy are the happiest. And those in occupations reporting lower wellbeing and higher anxiety? Those in sales related occupations report lower life satisfaction and worthwhile. Legal Associate Professionals and Economists report high anxiety. Interesting that Teaching and Educational Professionals report among the highest levels of ‘Worthwhile’ but also higher levels of anxiety. 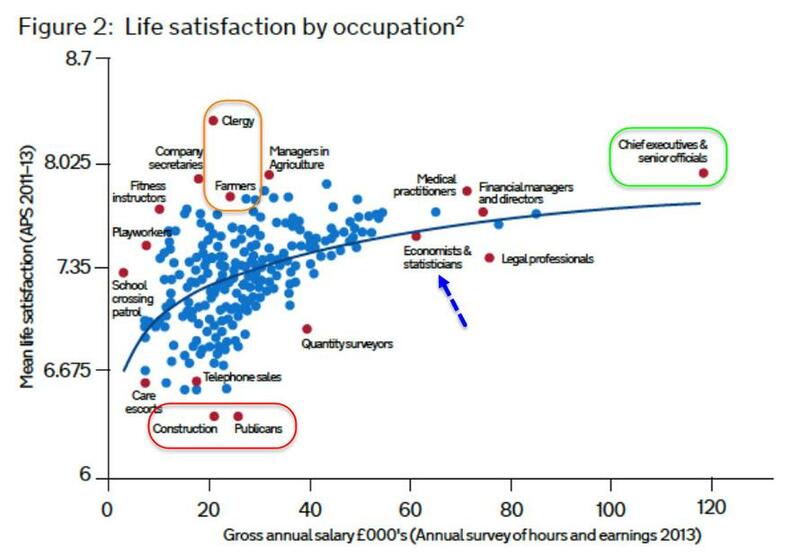 But bottom of the life-satisfaction scale are publicans and construction workers - who for the same general level of compensation could become men of the cloth, farmers, or hairdressers and enjoy a much higher level of wellbeing. The Anxiety question can capture positive and negative aspects of anxiety and there are other examples where we have seen high positive wellbeing coexist with higher levels of anxiety. Download the data and explore it for yourself. Take care not to over interpret the results though and make use of the sample sizes and standard deviations to understand the robustness of the different estimates.